Why do humans tend to focus on negatives? Hint: *not* because we’re bad or unenlightened. Why do people cry? Hint: *not* because we're weak or failing. Let's take a look at both of these questions. When we were still early in our evolution, it was essential that a negative/dangerous experience be remembered so that it wasn’t repeated. Act, or don’t; life, or death. It was imperative that our ancestors felt anxious when they were in places that seemed similar to where that poisonous snake attacked, for instance. Our bodies had to privilege scary memories for our safety and survival. The emerging cult of positivity clamoring “no bad vibes” and "good vibes only" is really starting to wear on me because it implies that ‘negative feelings’ (pain, fear, distress, anxiety, etc.) are bad and to be overcome/avoided—like it’s wrong, weak, out of control, or irrational to experience these emotions. Fear is wisdom in our bodies that we’ve inherited over centuries. It makes sense that we sort of adopted this "positive/negative" language because emotions have valences, or charges, which are (+) or (-). Doesn't mean we can't work toward a shared language that reflects more nuance with less judgment. When we don’t work to train our minds, which wander by nature, we can tend to focus on negatives because that really helped us to, you know, *not* die and keep reproducing! You aren’t ‘negative’ because you’re bad, but because you’re human. When we remember our evolutionary heritage, it helps us be gentler with ourselves and others when we’re experiencing emotional movements. And with less moralizing and a deeper appreciation for our psychobiological wiring, we can be more mindful and intentional about tuning into ‘positives' and expressing appreciation and gratitude. If we can see our bodies as wise and on our side, everything else changes. If we see our bodies as in our way and set on being inconveniences, we actually become threatening to our own bodies and nervous systems. Think about something as simple as a pain response. The language of our bodies and subcortical (lower, unconscious/automatic) brains is not English, it's action and sensation and feely feels; it's experiential. The body can't say, "Pardon me, could you please warm up by stretching before you do push-ups to impress people?" It just says "OW!" after and has to trust that you'll catch the memo. You can tear muscles if you ignore physical pain. It's one of our body's intelligent ways of talking to us and making us pay attention and remember to make sure to not to do stupid or careless things again. Memories encoded with pain stick. Like novelty. And threat. Or deep pleasure. It makes sense we evolved systems that organize information and energy flow based on experiences like pain, new things, and danger/threats. We needed bodies that could automatically scan for, tag, and encode repeated or crucial, life-threat things with certain codes like "danger," "pain," "pleasure," so we didn't have to waste precious upper brain energy on consciously thinking through every scenario which calls for various sets of approach and withdraw behaviors. Takes too much time, energy, and resources. We depended on having the fast, easy, automatic way as a default. So you remember for instance, red color on animals can mean bad bad death no AVOID. Your body acts to avoid danger creeeepily long before you consciously "decide" to move. Your brainstem and parts of the limbic system like your amygdala are super tuned into keeping on top of keeping you safe. Brainstem is always on repeat, multiples times per second, asking, "Am I safe?" It's got your back. But like, a grandma who gets up two hours early to check what the weather will be in your town so she can call and warn you if there's any risky-sounding weather that might come your way so you can bring an umbrella. Amygdala is also kinda like that sweet, worrying grandparent. It also notices sparkly and beauty; you can take it to the art museum. But it spends a lot of energy fretting about safety. Pain can be uncomfortable (emotional, physical, spiritual, sexual, existential) but it's crucial that we *turn toward* it with as much concern as a friend saying to us, "Help! I need you!" Pain is not to be ignored. And there are consequences for those who won't cultivate some tolerance for it; unless they end up lucky enough to lead a charmed, problem-free life. Pain isn't an "annoyance" or "weakness leaving the body" or "failure," it's an attempt at communication. If your body gets the vibe that you bulldoze pain, stuff/squash it, pretend it's not there, or will just ignore it, well, imagine what happens when you ignore a baby. You see a fit! Stress response. Protest. SOMETHING to make you pay attention! You know what your body and a baby have in common? If you guessed language, you're right! The language is action, movement, behavior. Babies also cry and sob it out more, right? You know what sobbing really is? This is sad but also kind of awesome. So, sobbing basically helps enervate (give energy to) our muscles. Think about how it makes certain muscles clench and striated muscles tighten with crying heaves. Yeah sobbing can seem like a bummer, but it's one of the ways our body balances discharging energy trapped in our nervous system and lifting our bodies up out of a collapse response in an effort to maintain baseline. At times you've sobbed, your body physically worried that you might collapse, not have the energy to get up, and die. Ever notice someone sounding like they're repeatedly gasping in-breaths as they sob and cry? Remember: in-breaths = sympathetic nervous system = fight/flight preparation. Your body is helping you mobilize energy to facilitate a change in internal state. Sobs get your core moving again. Many cultures around the world embrace this as a natural, healthy thing to do. In some cultures, people even hire others to come wail and weep at funerals to normalize it and encourage the funerary attendees to let loose. In some pretty heartbreaking animal experiments where they put lab animals through stress and then don't let some "shake" or "shake it off after," keeping them restrained and still, these animals suffer more distress, anxiety, and symptoms that go with trauma. The animals allowed to do their thing end up just fine; they literally shake it off. Language is where shame can be born. With language comes guilt. With language comes "stand up and brush it off you're fine" and "shut up, crybaby" and "you're being hysterical" and "you're acting like a child" and "pull yourself together" and "lock it up" and a zillion regional variations on this. But with language can also come, "it's okay to cry" and "you're safe here" "stay here with me, I've got you" and "there's no shame in crying" and "it's okay to express and feel your feels" and "just let it all out." If a friend is crying and I feel their pain, I sometimes cry too. It shows that we're human together and especially if they aren't used to feeling feelings in front of others, my face shows that it's acceptable to me to cry, that I will join and not judge. And I'll frequently join unconsciously, because we're connected. Oh and parents: crying in front of your kids is a gift for them; it's permission. Please note that although crying, even intense sobbing for short durations, can be health-promoting in response to stress and threat, you caaan get too revved up or spiral out of balance, especially if you also use particular substances or have certain genetic/psychological vulnerabilities. Call 911 if things feel out of control or get to the point of being unsafe. Never forget: crying is cool. 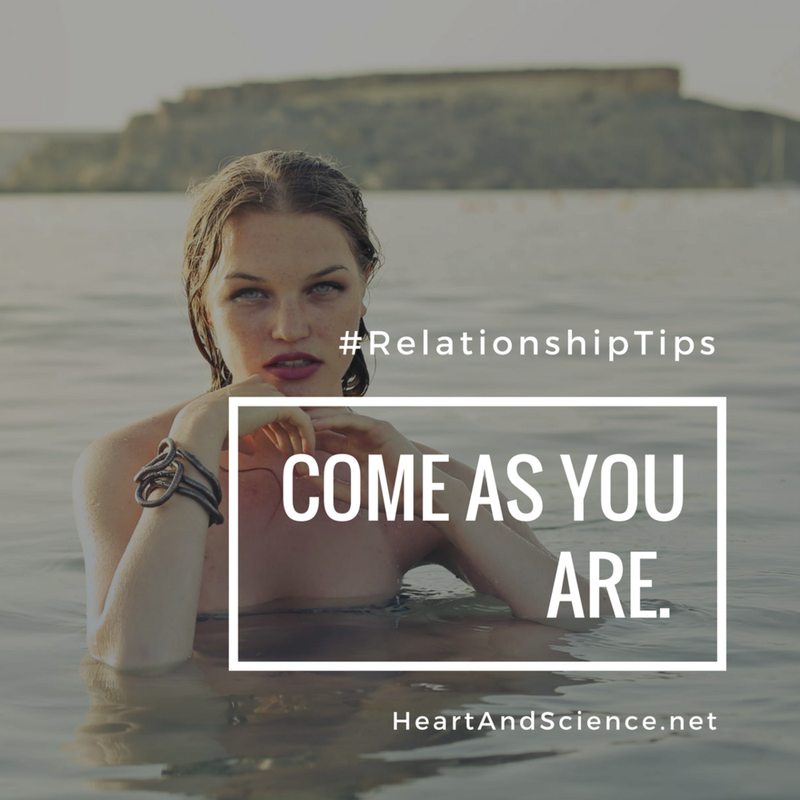 Come as you are, and bring your whole self! All parts are welcome.